her album, ZINC, and the sort of themes that inspired it. Although it is not released in the U.K. until 24th August, it has been getting great reception in Australia. Baker talks about that and where she heads now in terms of material and touring. 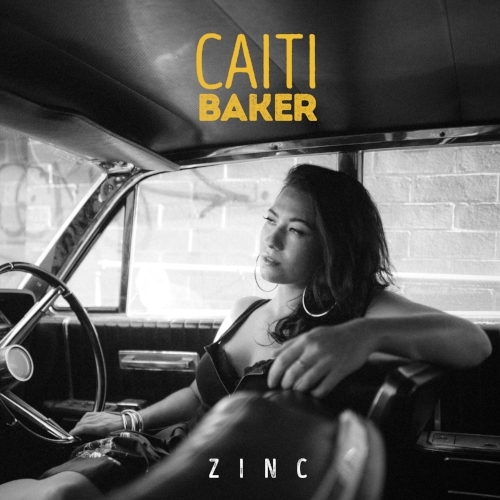 I ask her what it is like writing ZINC with chronic fatigue syndrome; how she got into songwriting to start with; the albums that are most important to her; some upcoming artists to look out for; whether she gets time to unwind away from music – Baker ends the interview with a fantastic song. Hi, Caiti. How are you? How has your week been? I’m great, thank you! My week has been fun and hectic. The Darwin Festival is currently on and I’m also moving house. So, I’m doing a lot of socialising, seeing shows at the festival and packing up a house! My name is Caiti Baker. I’m a singer, songwriter and performer. I’m from Darwin (NT), Australia and I’m either at home writing and recording music or touring the country! The album, ZINC, is out on 24th August (in the U.K.). Can you talk about the sort of themes that inspired the record? Having had chronic fatigue syndrome and bipolar disorder for six years, I was either in a state of inflammation (depressed, manic or moody) or I was asleep. I wasn’t ‘absorbing’ life. For those six years, I don’t remember a whole lot – I didn’t feel like me. So, in healing these conditions, I was essentially having a rebirth and that’s a songwriting gold mine! A lot of what I wrote about on ZINC was inspired by finding my identity and all the aspects of life; love and conflict that come along with that. I believe you were battling chronic fatigue syndrome before and during its creation. What sort of impact did that have on your mindset and output?! I healed myself halfway through the writing process for ZINC. So, as mentioned before, I was writing a lot about identity, love; conflict and the experience of transitioning from one state of existence to another. It was therapeutic and cathartic to be able to create art out of a challenging and troubling situation, so I’d say the experience on a whole was positive. I also find that sometimes I write with my subconscious. Songs will pour out that don’t make much sense until a much later time. There’ll be a moment when it hits me and something settles - an inner-calmness, like I’ve solved something internally and my brain has just caught up. There are a few songs on the album where that was the case! ZINC has been out in Australia a little while – gaining great reviews. Is it a relief to know something you have worked hard on has hit a chord and resonated?! Absolutely! Even if I wasn’t fortunate enough to have the support to get my music out there, I’d still be creating. So, just knowing that there are people out there discovering my music every day and being affected by it in one way or another is a combination of many emotions (! ): happiness, humility and excitement. Sometimes, it’s overwhelming but it’s all positive! I love reading reviews and hearing the interpretations of the songs; it’s interesting to me. Which artists have been most influential to you? Who do you count as idols? I was fortunate to be born (because of and) into a household of music. Blues music, to be more specific! I have so many influences because of my upbringing so I’ll keep the list as short as possible! Big Mama Thornton, Ray Charles; Little Walter, Etta James; Aretha Franklin, Sweet Honey in the Rock; Bobby ‘Blue’ Bland…Aaliyah, Fiona Apple; Missy Elliott, Timbaland; The Neptunes, Lauryn Hill; Jay-Z, Wu-Tang Clan; Erykah Badu, Jill Scott; Leela James, TLC; SWV, Destiny’s Child; Wyclef Jean, Brandy; Faith Evans…the list goes on and on! How did you get into songwriting? Was there a moment you knew that is what you had to do?! Just being surrounded by music and having that genetic ability - I think it was predetermined that I’d be a writer, singer and performer. I don’t remember the moment it started; I just remember doing it. My dad got a digital 8-track recorder when I was twelve and he couldn’t work out how to use it, so I did. I started recording what I had written then. That’s how I began stacking vocal harmonies and writing over Hip-Hop instrumentals. I’m gonna have a bunch of new songs written, recorded and produced by the end of 2018! I’ll have completed a national tour, released two more songs (the last of the songs from the Zinc chapter) and play a few festivals. I’m lucky to have so many; I wouldn’t know where to start! Playing WOMADelaide (a renowned World music festival) in 2017 and the Byron Bay Bluesfest this year have been two incredible experiences that I’ll never forget! Touring with and supporting the late Dr G Yunupingu on a national tour was special and unforgettable. I’d say that releasing new music into the world and hearing people’s reactions is one of my favourite things. This is just straight-up-difficult so I’m gonna have to make it easier for myself! I get immersed in albums for the entire experience and I become obsessed. So, I can listen to one album every day, a number of times for days, weeks and months on end - it depends on what’s going on in my life at the time. So, life experiences and emotions get attached to albums and therefore have a significant impact on me. I’m gonna give you a list of ten! Twenty-four songs of Aretha Greatness. Collectively, her sound, dynamic; instrumentation and arrangements are timeless and have been a massive influence on me. Aaliyah revolutionised R&B with Missy Elliott and Timbaland. I love every track on this album. I still think it’s a classic. This album is potent, dynamic; full of soul and will not age. Angel Haze (A.K.A. Roes) is an amazing rapper and Incredible singer. She’s an inspiring artist to me. This album has a lot of emotion attached to it for me as I was obsessed with it over an interesting time during my fatigue. I don’t remember much but I’ll listen to this album and I’m taken back to places I was when I was obsessed with it and I’ll start to remember things. It’s just a beautifully written body of work. The latest album I’ve been obsessing over. It’s just a strong Hip-Hop album that knocks and he’s one of my favourite rappers who is amazingly musical and creative in every project he creates. It’s hard to fault Missy. Her debut studio album, created with her equally groundbreaking collaborator Timbaland; Supa Dupa Fly just hit me in the soul as a kid. I loved everything about this album and it’s been a very big influence on my sound. This album is just a straight-up banger. Great R&B, Soul and Pop songs produced amazingly and executed incredibly by Rihanna. I love every song on this album. Fiona is unapologetic, wild; thrilling and bold. Her voice is liquid gold and her songs are so interesting. I love the production and arrangements on this album. I love everything these guys do but I smashed RTJ3 in 2017. I spent a big chunk of time listening to this album and being energised by it on so many levels. El P’s production is wild; Killa Mike is one of my favourite rappers and I love what they both stand for. What a wonderful experience this album is. Sonically and emotionally, it melts right through me. That’s ten! But, I can add three Jay-Z albums, two Kendrick Lamar albums; an Irma Thomas album, Redman and Method Man; Rah Digga, Solange; Beyoncé, TLC, Leela James; Anthony Hamilton…the list goes on and on and on and on! Oh, this is tough! Wow. I’d love to support Jacob Banks. As for (hospitality?) rider - I’d be ok with what I tend to have – what my band likes to drink, some food; white towels, gum…I don’t need much! I am doing a National Australian Tour in September/October. Dates are on my website. Be you. Don’t be a jerk. Follow your gut instincts; understand your own and your band’s expectations and surround yourself with good people. Alice Skye, Emily Wurramara; Stevie Jean (I’m taking her on tour with me! ), Serina Pech and Tasman Keith. Nope! Haha. It’s a 24/7 life but I love it. Periodically, I’ll take a trip to the mountains; turn the Internet off and reset everything. I’ll be doing that again in late October. To unwind on a daily basis…I watch comedy, listen to podcasts and immerse myself in good T.V. I love going out for a dance, too. That’s a good way to unwind…or down to one of the beaches to walk in the sand. Aw; this is so tough! Ummmm. Let’s go with Criminal by Fiona Apple!